This past weekend, an ace team of farmers, fabricators, engineers, and pedal-powered truckers gathered at Metro Pedal Power in Somerville, MA for a weekend build event. What project would bring such an intriguing group of individuals together? Only the culticycle, a pedal-powered cultivating tractor designed by Tim Cooke, that uses human brawn and bicycle brains to replace fossil fuel powered tractors for lightweight field cultivation. First, a quick introduction of our weekend hosts. Metro Pedal Power is a pedal-powered hauling business in the Boston area, replacing box trucks with custom-built freight trikes to haul last-mile inter-city freight such as compost, recycling and CSA shares. They hope to reduce urban congestion and traffic, improve human wellbeing, and encourage others to see the appropriateness of pedal power in the urban environment. Wenzday and Eric from MPP generously hosted the build event at their fully outfitted shop in Somerville, without which the event would have been wholly impossible and a lot less comfortable. Many thanks to them and the rest of their team for hosting, convening and offering their fabrication skills. The goal of the pedal power hack was several fold. We wanted to showcase an already built culticycle for those who had never laid eyes on it before, and bring minds together to brainstorm improvements as Tim moves forward in his development of the tool. Several attendees also were in the process of building their own culticycle, or had already done so, so we additionally hoped to build some replacement components and share knowledge of the build process that we could take home with us. Additionally, we wanted to document the tool more thoroughly, specifically in CAD design format to be shared freely on the Farm Hack Tools platform. We also wanted to use this opportunity to shoot video and take photos to capture the Farm Hack collaborative design and build process as it was happening. With those goals in mind, we set forth Saturday morning by working together to assemble a pre-built culticycle, so that everyone would have a chance to look over the design and get a sense of how the pieces fit together. We then split into several teams. Team 1 started from scratch with steel stock, cutting and grinding the structural pieces of the chassis – using Tim’s documentation to guide their effort but also improving upon the design as they went. Team 2 worked on “Culti 2,” a culticycle which was about halfway completed but still needed steering linkages and the parallel lift which raises and lowers the tools. Team 3 began to rebuild the “belly mount,” or toolbar, which is attached underneath the culticycle and which the weed killing tools are clamped to. This new and improved belly mount will be delivered to Hawthorne Valley Farm and installed on their culticycle, replacing the older, less robust model which was a part of the earlier culticycle design iteration. For a day and a half, the shop buzzed with activity as folks dropped in to observe the process or get their hands dirty cutting, grinding, and welding. Lu Yoder brought along his pedal powered grain grinder, grinding wheat and making bread on Saturday and grinding corn for his brother Chris’s CSA Sunday. By midday Sunday, we had made significant progress on both the second and third culticycles, finished a pile of DIY, cheaply made star hoes, nearly completed the belly mount, and made many small modifications and improvements to the Culticycle. 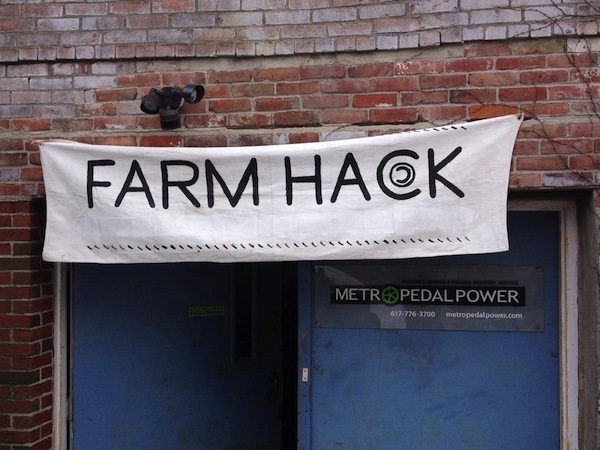 Farm Hack supports an approach to tool design and innovation that is built on principles of resilience. Instead of the top-down approach to tool development put forward by corporate agribusiness, the event this weekend prioritized local manufacturing, easily repairable and modifiable tool design, and collaborative and iterative research and development. For the better part of the last decade, Tim Cook has spent countless hours in his basement shop designing, tinkering, and building this machine from scratch. This is a familiar model: an isolated innovator who is the focused, driving force behind a revolutionary tool design. The community of support which showed up this weekend to pitch in, cut, weld, prototype, and offer their design feedback and support are a vital part of this process of resilient design.